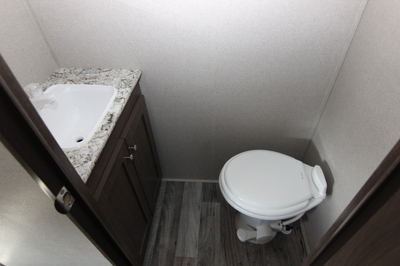 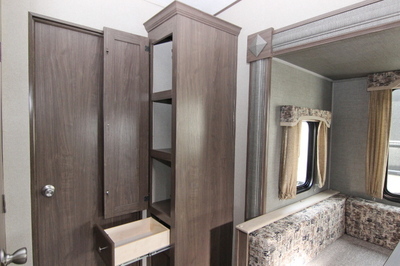 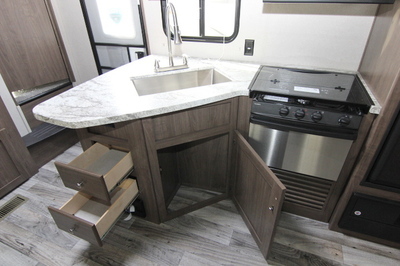 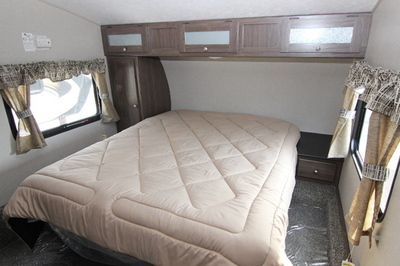 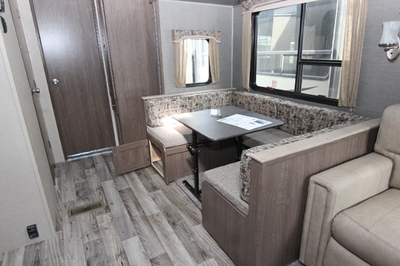 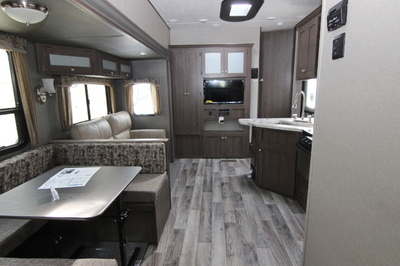 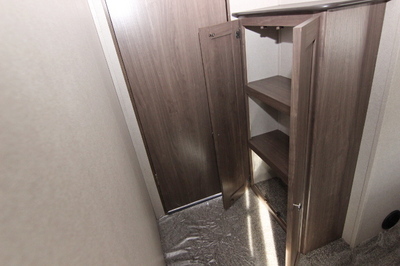 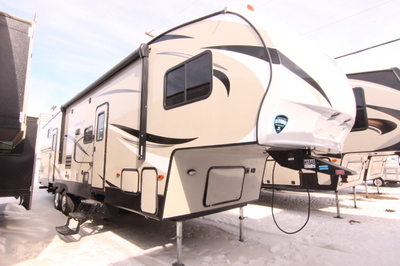 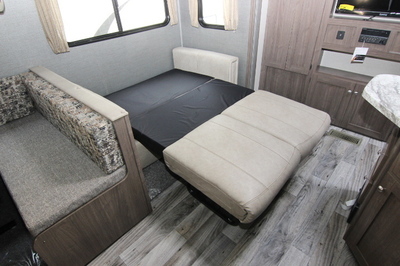 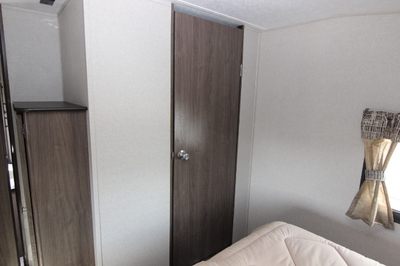 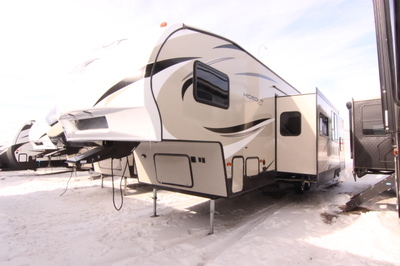 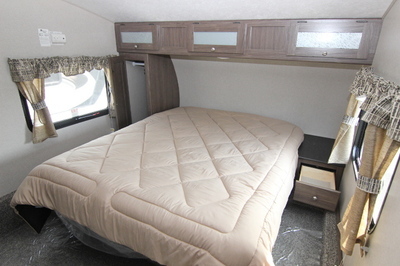 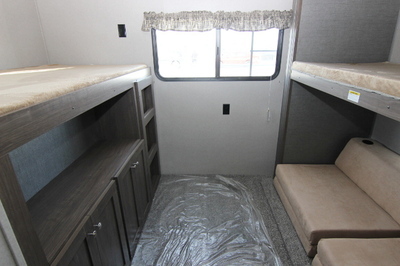 Packages and Options included with this unit:- Platinum Package, Hideout Luxury Package, Cold Mountain Package, Central Vacuum, Electric Rear Stabilizer Jacks, 15.0 BTU Air Conditioner - Ducted, Aluminum Wheels, 15" Spare Tire Kit, Exterior Ladder, Tri-Fold Sleeper Sofa. 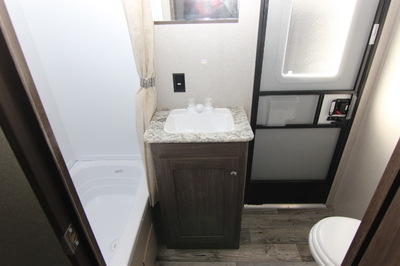 Hideout Mandatory Features:- Hideout 5th Wheel Luxury Package,Platinum Package, Electric Rear Stabilizer Jacks, Cold Mountain Package,Aluminum Wheels, 15” Spare Tire and Carrier, 15.0 BTU Ducted Air Conditioner, Roadvac Central Vacuum System with Hose Kit. 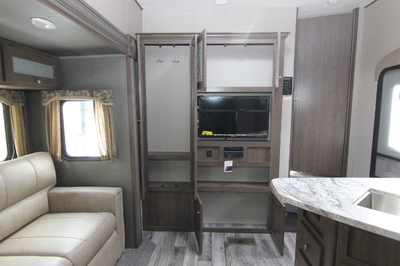 Hideout 5th Wheel Luxury Package:- Night Shades in Living Area, XL Entry Assist Handle, Black Tank Flush, LED Adjustable Power Awning, DVD/CD/MP3 Bluetooth Stereo, 30 X 50 Empress Shower (N/A 308BHDS), Central Monitor Panel, 12 Volt Charging System, LED TV with Exterior Mounting Bracket. 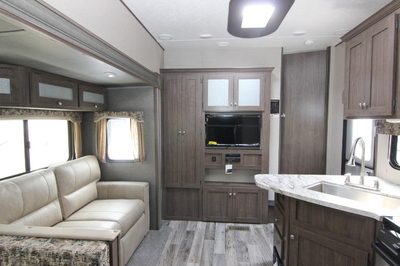 Hideout Platinum Package:- Molded Fiberglass Front Cap with Hitch Vision Laminated Champagne Side Walls. 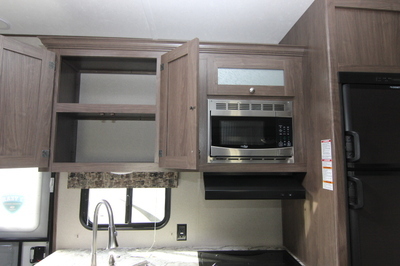 Interior Standard Features:- Range Hood with Light and Exhaust Fan, Stainless Steel 3 Burner Range with Oven, 8 CU. 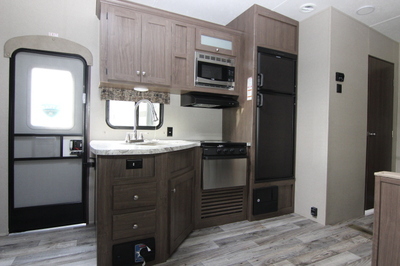 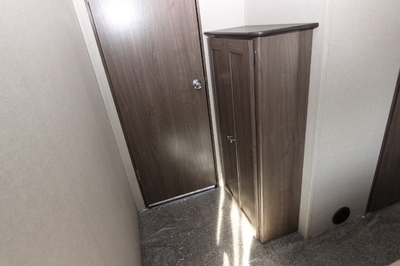 FT. Gas/Electric Refrigerator, Stainless Steel Microwave, High Rise Stainless Steel Faucet, 60/40 Kitchen Sink, Cable TV Hook Up with Booster,Reversible Bedspread, Porcelain Foot Flush Toilet, Bathroom Exhaust Fan, Quick Recovery 6 Gallon Gas/Electric DSI Water Heater, 30,000 BTU Furnace, 12 Volt 55 AMP Converter. 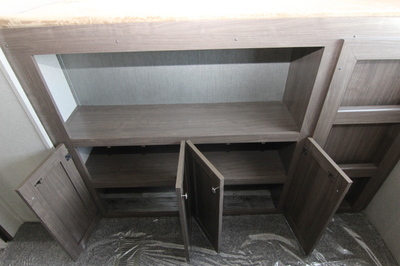 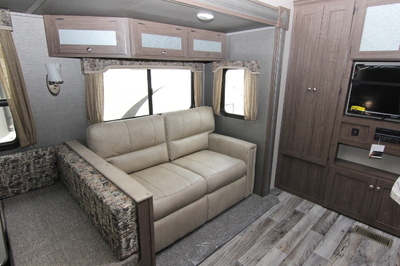 Exterior Standard Features:- Lighted Pass Thru Storage Compartment, Easy Lube Axles, 2 Exterior Marine Grade Speakers, Seamless One Piece TOP Roof Membrane, Fully Walkable Roof, Main Entry Triple Steps, Tinted Safety Glass Windows, Digital TV Antenna,Extended Long Rain Gutters. 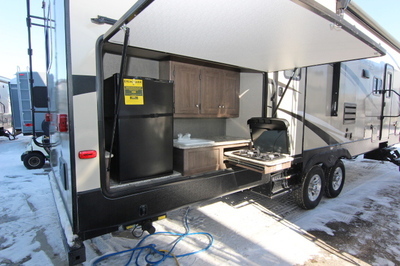 Exterior:- Hideout Patented Hitch Vision, Gel Coated MAX Turn Fiberglass Front Cap, Electric Adjustable Front Landing Gear, Lighted Adjustable Power Awning, Black Tank Flush, Outside 110 Receptacle, XL Entry Assist Handle,Exterior TV Hookup/Cable and Bracket, Cold Mountain Package, Power Coated I-Beam Frame, Easy Lube Axles, Full Length Outriggers, Dual Battery Rack,Exterior Speakers, Black Radius Window Frames, TV Antenna with Booster, Cable Hook Up, Full Walk on Roof, Radius Entry Doors w/Integrated Struts, Oversized Pass Thru Storage, Hose Storage in the Bumper, Rain Gutters with Down Spouts,Four Stage Slide Room Seals, Roto-Cast Seamless Holding Tanks, Hurricane Straps Reinforced Structure, four Heavy Duty Stabilizer Jacks, Radial Tires, Cambered Chassis, 96” Exterior Width, Exterior Shower. 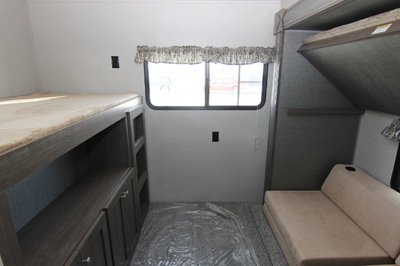 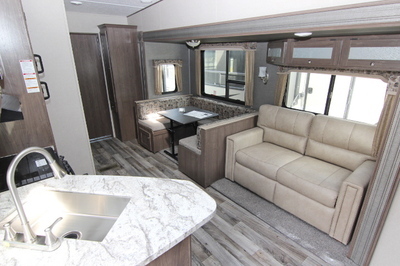 Interior:- Tri-Fold Sleeper Sofa, Pleated Shades in Living Area, Full Strutted Storage under Master Bed, HD LED TV, Interior Surround Sound Speakers, Bluetooth DVD/CD/MP3 Stereo, Hidden Laundry Chute, Microwave, Monitor Panel, 8 Cu Ft Refrigerator, Ball Bearing Drawer Guides, 12 Volt 55 AMP Converter, 15,000 BTU Air Conditioner, Built-In 30,000 BTU Furnace, Gal/Electric DSI Water Heater, Flex Pex Tubing with 10 Year Warranty, Tub Surround, Foot Flush Toilet, RGG Cable and Satellite Wiring, 41/2” Crowned Roof, Loomed Wiring, Range with Hi-Output Burner, Reversible Dinette Cushions, High Rise Kitchen Faucet. 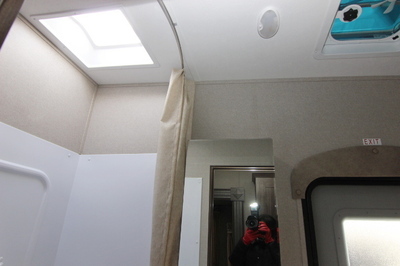 Safety:- Safety Chains,Electric Brakes, LP Gas Detector, Fire Extinguisher, Tinted Safety Glass, Break Away Switch, Carbon Monoxide Detector, Smoke Detector, GFI Electrical Outlets.